A celebration of life will be held Saturday, March 24, for James Harrang, an alumnus and steadfast supporter of the university. Harrang died Dec. 11, 2017. He was 94 years old. Harrang earned a bachelor’s degree in philosophy in 1948 and a law degree in 1951, both from the UO, graduating on the G.I. Bill after serving in the lauded 10th Mountain Division during World War II. He stayed in Eugene after graduation and became a founding partner of what is now the law firm of Harrang Long Gary Rudnick P.C. A longtime donor to the UO School of Law, its student center is named after him. Harrang maintained deep ties to the university in other ways, too. 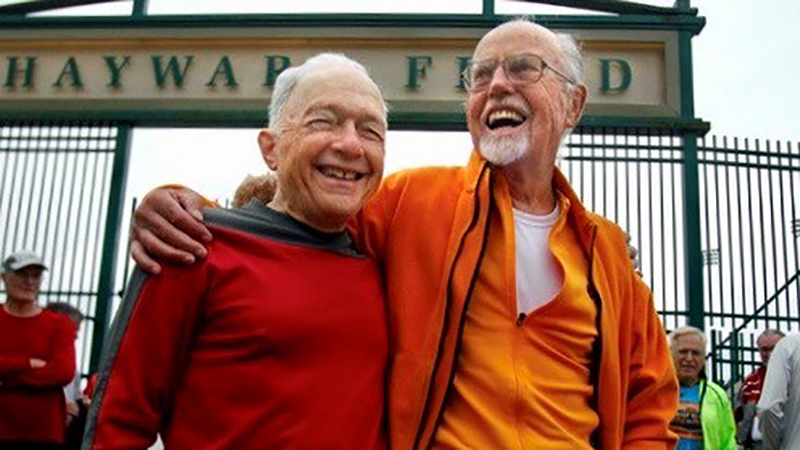 He was a fixture at the Student Recreation Center, even after his retirement in 2007, and was an active participant in a noon campus running group he co-founded in 1961. The celebration of life will be held at the Rec Center from 2 to 4 p.m. In lieu of flowers, friends are encouraged to join the family in supporting the University of Oregon Foundation by mailing a donation in any amount to Gift Services, University of Oregon Foundation, 1720 E 13th Ave., Suite 410, Eugene, OR 97403-2253.